Ever since President Obama announced his intention to fight -- again -- for broad-ranging immigration reform in his Feb. 13 State of the Union address, media coverage has been dominated by his struggle to find common ground with the so-called Gang of Eight key U.S. Senators, including Florida Republican Sen. Marco Rubio. But Obama's biggest obstacle to pushing through reform in the coming months may be a Gang of Seven Senate Democrats -- including four in the South -- who face difficult elections in 2014 and will be carefully calculating the political pros and cons of embracing Obama's immigration overhaul. Shortly after Obama's speech, Larry Sabato's Center for Politics reported that "the seven most imperiled [U.S. Senate] seats in the whole country are all currently held by Democrats." The top battlegrounds include seats currently held by Sens. Kay Hagan in North Carolina, Mary Landrieu in Louisiana and Mark Pryor in Arkansas, as well as an open seat vacated by retiring Sen. Jay Rockefeller of West Virginia. Obama lost all four states in 2012. And, as Jennifer Duffy of the Cook Political Report predicts, if any of the Democrats back Obama on immigration, "Republicans will add it to the litany of things that they supported the president on" in their 2014 election year attacks. But isn't there a political advantage to embracing immigration reform? Policy merits aside, the push by Obama and Democrats on immigration is widely seen as a nod to the growing political clout of the Latino electorate, a key constituency in Obama's 2012 victory and a central part of wider demographic changes that will benefit Democrats in the future. It also exploits increasing divisions within the GOP over how to approach the immigration debate. There's no doubt about the growing strength of Latino voters: The National Association of Latino Elected Officials estimates that 12.2 million Latinos voted in 2012, making up about 10 percent of the electorate. Nationally, the number of Latino voters is expected to double in roughly a generation. But how big of a force are Latino voters in the key 2014 Senate battleground states? Southern states have among the nation's fastest-growing Latino communities: According to the 2010 Census estimates, nine of the 12 states with the fastest Latino/Hispanic growth between 2000 and 2010 were in the South, including Arkansas (114% increase) and North Carolina (111%). The most interesting state to watch will be North Carolina. In 2010, Sen. Hagan was one of five senators to oppose the DREAM Act, which would have provided a pathway to citizenship for an estimated 51,000 youth in North Carolina. 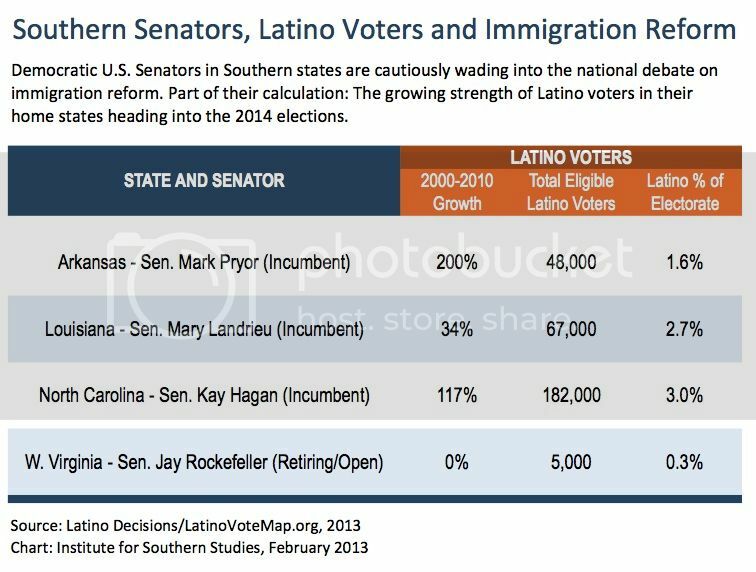 In 2014, Latino votes may be critical to Hagan's re-election chances -- but that will depend in large part on whether the state's Latino communities fully flex their electoral muscle. While there are an estimated 180,000 to 200,000 voting-eligible Latinos in North Carolina, a post-election analysis by Democracy NC [pdf] found that only 61,795 voted in 2012, making up just 1.3 percent of the statewide vote last year. That was likely a result of two factors: first, low registration rates among voting-eligible Latinos, and second, a turnout rate of just 54.3 percent among those North Carolina Latinos who are registered (compared to 68.6 percent for whites and 70.2 percent for African-Americans). With concerted and well-funded registration and turnout efforts, the influence of Latino voters could expand dramatically in North Carolina. I am certainly more optimistic on this item than just about anything facing us today. There are already two or three different bipartisan groups who are meeting to come up with good common sense legislation that can pass ... I do believe that comprehensive immigration reform will take place in this Congress.